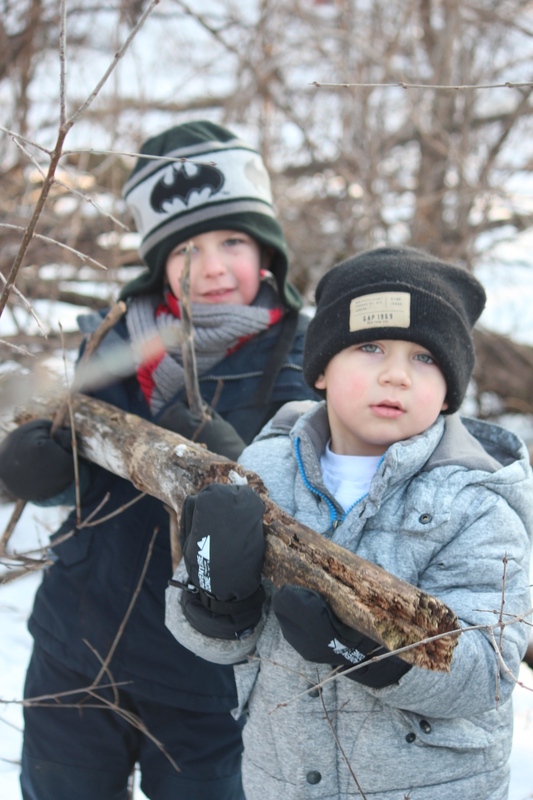 A four year-old boy is intently engaged in the work of setting up a wooden board against a tree branch to make a slide. The wood is twice as tall as he is and weighs almost as much as he does. It is cumbersome to carry as the child waddles his way to the tree. He experiments with the board at different heights on the tree branch, deliberately settling on a low incline that will allow him to slide down at a speed at which he can land on his feet. This child has now spent ten minutes perfecting his slide. A three year-old girl comes to his work space to find out what he is doing. He says he has made a slide, demonstrates how to use it, then lies down on it. “I’m sleeping. I was working so hard!” The girl wants a turn on the slide, but he holds firm – it is his. She stamps her foot and begins to cry loudly. A teacher watching this exchange steps in and prompts the girl to ask for a turn, which she does. Hearing “You can have a turn when I’m done,” her crying efforts are redoubled. The teacher shares that the builder gets to lie on his slide as long as he wants and when he is done, she can have a turn. The crying becomes louder and she pounds her fists on the board until it nearly slips off the branch. At this, the teacher gives her two choices: she can back up and watch until he is done resting, or she can play elsewhere until the slide is available. Clearly torn, she cries for another minute and then moves onto another play area. Within minutes, she is happily engaged in play with other children. What can we learn from this? Through the slide builder, we see risk-taking, experimenting, inventing, questioning, and problem solving. We also see that when motivated, attention spans can be longer than most adults expect. Through the child crying, we see an unsuccessful attempt to gain control, an undesired outcome, and final a move to productive play. But should these unproductive outbursts be punished? Here at All Seasons, I have found that the answer is a resounding NO! Children most often engage in “mistaken” behavior when they do not understand what is happening, or when they are not getting what they want. In the end, their challenging behaviors come out of power struggles, both with others and with the limited abilities that do not match their own expectations. When teachers respond to this power struggle with negative reinforcement (i.e. punishment), the child’s struggle for power and control only becomes greater. The child is losing control of what is happening to her little body – and fast – and may very well respond with fear, anger, or sadness. However, positive reinforcement enriches the relationship between the child and the caregiver. It allows for shared power, as children are trusted to make decisions for themselves in situations in which they first find themselves losing control. They are told what they can do, rather than what they cannot do. In essence, the caregiver is telling the child I believe in you. I trust you. I love you. And I know you can do this. The teacher’s approach to the conflict modeled this trust for the second child, while showing respect for the first. Every Wednesday afternoon, the Autumn Room visits the Inver Glen Community Room. There, we do a variety of activities with the grandmas and grandpas, from Bingo to Balloon Ball to acting out our favorite stories. Last Wednesday, we painted birdhouses. 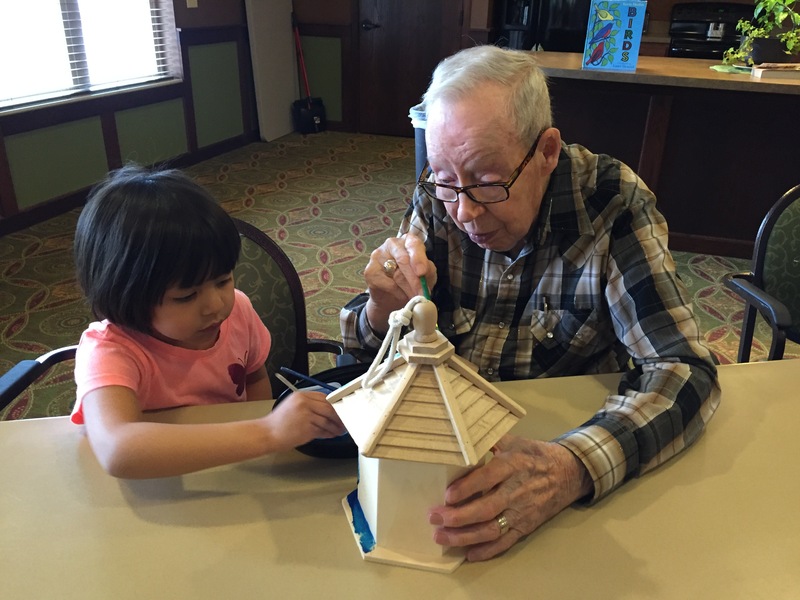 Each child paired with a senior partner, and together they painted a single birdhouse. 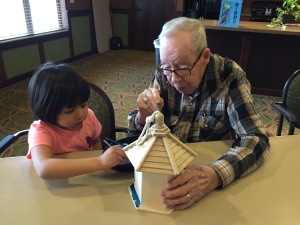 The results were beautiful – not just the birdhouses themselves, but in how the seniors and children worked together. Conversation was flowing, and collaboration was essential. Most seniors let the children take the lead. 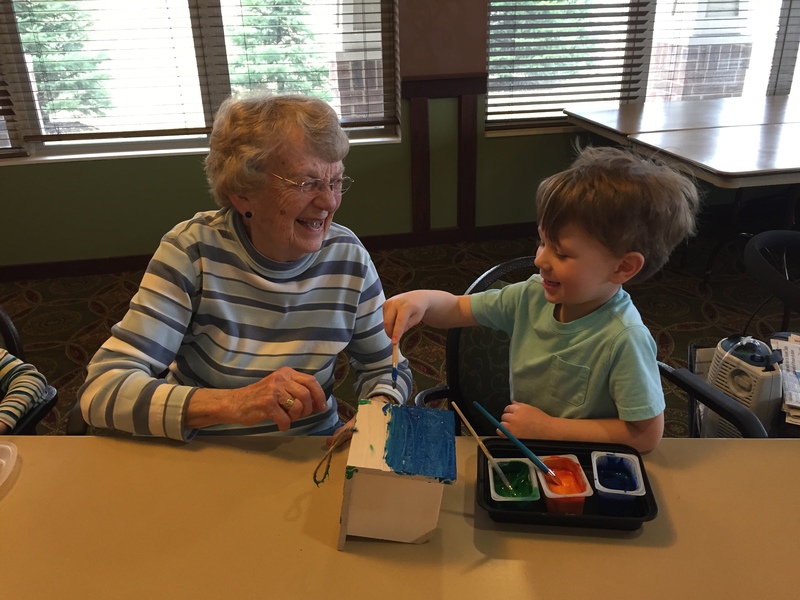 One boy wanted to paint his whole birdhouse blue, and his grandma was happy to help, leaving the orange and green paints untouched. Another pair took turns painting stripes on the roof of their birdhouse. 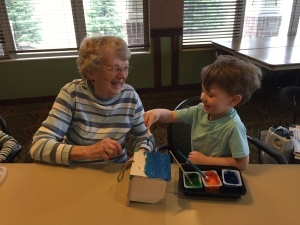 One grandma painted her partner’s name on the roof of the birdhouse, and the two of them gingerly worked around it for the rest of the painting time. I noticed one grandpa had painted a smiley face on the roof of a birdhouse. I pointed out to his partner, “Look, Marty painted a smiley face!” The child replied, “That’s not a smiley face; that’s Grandpa Marty!” Grandpa Marty replied, “Yes, that’s me!” While admiring our finished birdhouses, we acknowledge the depth of all that was happening during this shared experience. Between the lines, what may appear as blobs of paint haphazardly dabbed on a birdhouse is actually carefully plotted polka dots. A simple smiley face is really a self-portrait. That afternoon, the best I could do as a teacher was to observe and learn from what I saw. Some things are not worth analyzing. 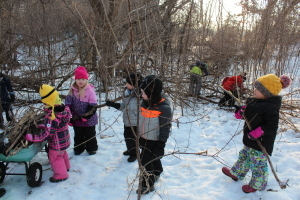 The simplicity and depth of this shared experience exemplified the true magic of intergenerational learning.